♥ Those sunglasses remind me so much of the ones Carrie inherited from her Mother's closet during the first episode. The spot jumper is also very 'Carrie', she does love her patterned knitwear! 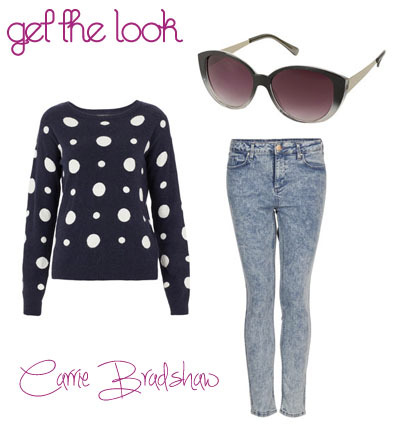 ♥ This is the outfit I can imagine Carrie wearing to go to her internship in New York City. That dress is so beautiful & the bag could easily be splattered with nail polish if you want to channel the Carrie Bradshaw of 1984. Yes, the shoes are Louboutins but I couldn't resist paying homage to modern day Carrie as well. I hope you've enjoyed this post! I did have fun playing stylist & will probably do more of these types of posts in the future. ♥ Right now I am loving this song by Adele. If you haven't heard her first album already jump on Spotify to have a listen. Definitely do this if it's raining again today.